In a recent Nature article, Rintoul et al. present two narratives on the future of Antarctica and the Southern Ocean, from the perspective of an observer looking back from 2070. In the first scenario, greenhouse gas emissions remained unchecked, the climate continued to warm, and the policy response was ineffective; this had large ramifications in Antarctica and the Southern Ocean, with worldwide impacts. 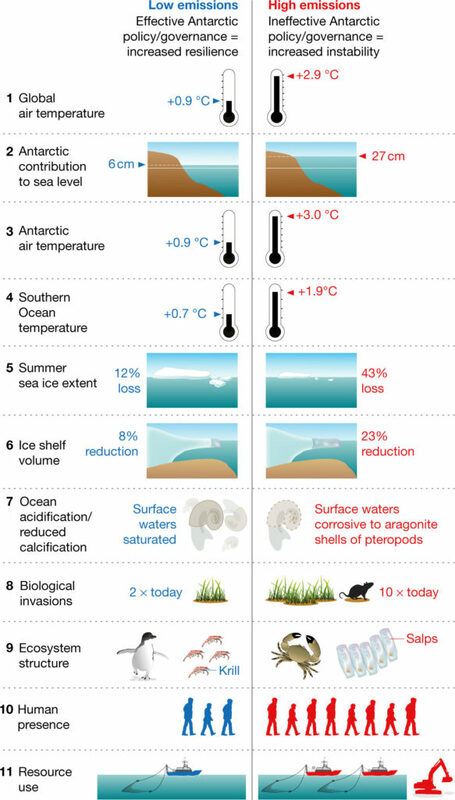 In the second scenario, ambitious action was taken to limit greenhouse gas emissions and to establish policies that reduced anthropogenic pressure on the environment, slowing the rate of change in Antarctica. The two scenarios are highly speculative and intended as counterfactual catalysts for discussion, rather than as predictions of the future. Choices made in the next decade will determine what trajectory is realized. Read the full article at the following link. A short Australian Academy of Science video is available here. The article is also referenced in The Conversation at: ‘Antarctica has lost 3 trillion tonnes of ice in 25 years. Time is running out for the frozen continent’. Figure: Antarctica and the Southern Ocean in 2070, under ‘low emissions/high action’ (left) and ‘high emissions/low action’ (right) scenarios. Differences are relative to a 1986–2005 reference period. (Rintoul, S R, et al., (2018) “Choosing the future of Antarctica.” Nature 558(7709): 233-241.